You've probably heard of Loot Crate before, the subscription service that sends you a nerdy box o' swag at reduced cost. But what if you were the type who wanted a Loot Crate that was just about the post-apocalyptic world of Fallout? Well, person I just made up, you're in luck: Fallout Crate packages together various knick-knacks and merch, all of it Fallout-themed, starting this December. Unlike some Loot Crate subscriptions though, Fallout Crate will not be monthly. Instead, it'll be bi-monthly, so you'll receive your package every other month. It's also a teensy bit more expensive at $34.99 instead of the typical Loot Crate price of $15.99. But on the plus side, you're getting more than you would in your average Crate, so it's a fair trade-off. Speaking of what you'll get, part of the appeal in a Loot Crate is that you don't know exactly what you're getting, but here are a few confirmed items in the Fallout Crate series: an exclusive figure line based on companions from the games, the first being Fawkes from Fallout 3. Each crate will also contain pieces of power armor, so you can eventually build your own (toy-sized) suit. 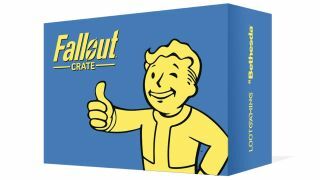 Pre-ordering a year's worth of Fallout Crate will also get you an exclusive, unrevealed item, as well as a USB hub shaped like a mini-nuke. Sadly, there are no tickets valid for one free admission into a Vault-Tec vault. Yet.